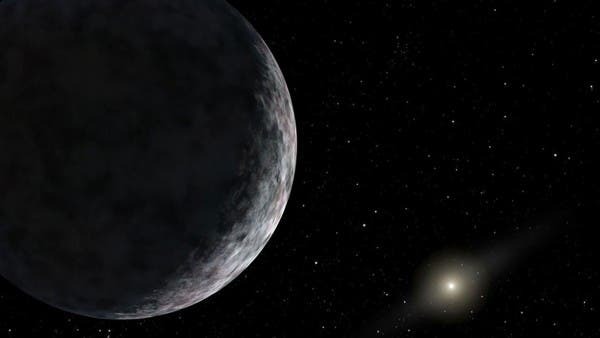 A new dwarf planet, designated V774104 has been identified and now takes the crown of most distant object in our solar system, being three times farther away than Pluto. The dwarf planet is estimated to be between 500 and 1000 kilometers across. Astronomers don’t yet have enough data to estimate its orbit and estimate that about an year of observations is needed to gather enough data for a precise answer. They suspect that V774104 will end up joining an emerging class of extreme solar system objects whose strange orbits point to the hypothetical influence of rogue planets or nearby stars. “We can’t explain these objects’ orbits from what we know about the solar system,” says Scott Sheppard, an astronomer at the Carnegie Institution for Science in Washington, D.C., who announced the discoverytoday at a meeting of the American Astronomical Society. V774104 currently sits 15.4 billion kilometers from the sun, or 103 astronomical units (AU) away. One AU is the distance between Earth and the sun. V774104 could join one of two groups, depending on it’s exact orbit. Should it come closer to the Sun on part of its trajectory, it will be classified together with a more common population of icy worlds whose orbits can be explained by gravitational interactions with Neptune. Should it stay relatively far away from our star it will join two other worlds, Sedna and 2012 VP113, who keep between 50 AU and 1000 AU distance from the Sun. Sheppard calls them “inner Oort cloud objects” to distinguish them from icy Kuiper Belt objects, that reside between 30 and 50 AU. The Oort cloud is a hypothetical, thinly populated sphere of icy bodies, thousands of AU away, that marks the edge of the solar system and the end of the sun’s gravitational influence. Oort cloud objects have eccentric orbits that cannot be explained by the current known structure of the solar system, and it is suspected that other factors come into play when shaping their orbits too — such as an yet-undiscovered giant planet that disturbs Oort cloud objects, or even remnant movement from the creation of the Solar system. “They carry the signature of whatever else happened,” says Mike Brown, a planetary astronomer at the California Institute of Technology in Pasadena, unaffiliated with the discovery. Currently, Brown holds the claim of having discovered the most distant solar system object, which came in 2005 when he found the dwarf planet Eris at a distance of 97 AU from the sun.